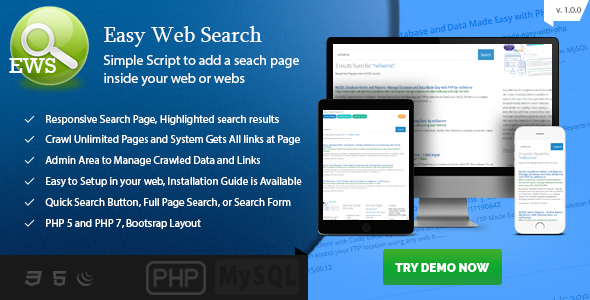 Easy Web Search is engine to use inside a web site. Simple Crawling System is available to submit URLs and Links and XML Site Maps. URLs From submitted Sites or Site Maps will be automatically added to search database when admin run crawling. Once crawling is done the links with their contents (Title, Description, Keywords and Plain text from web link) will be available to search. If the total web site is linked to itâ€™s home page, you need jut give home page url or xml sitemap to the system and run crawling once.